You are browsing the archive for 2008 October. PCOer Chris Burke sends a visual report on the phenomenon of rubber, or, rebounding artwork. Clients always want artwork as soon as possible but, strangely, there is always time for it to come back for changes. We offer here an example of Chris’s work with before and after images showing the changes requested in a complex piece of caricaturing he did recently. First, here is the original and approved piece of art. Secondly, the unexpected changes which were subsequently requested – in this case, it was a question of different people being asked for. We’ve marked them here to help. And at last, the final version. It is hard work being a professional cartoonist. Whenever there is a show dedicated to a big name in the world of painting, such as Monet or Rothko, the media describes it as a “blockbuster exhibition”. Well, this must be the equivalent in the cartooning world, as it features one of the giants of the artform: Carl Giles (1916-1995). The exhibition of more than 80 works includes wonderful colour covers as well as drawings never reproduced in the annuals. His studio is recreated complete with desk, drawing board and reference material. Also revealed are less familiar aspects of his career including his time as an animator, his propaganda work for the Ministry of Information and his work as cartooning war correspondent. The Cartoon Museum, Little Russell Street, London, is open: Tues-Sat, 10.30am-5.30pm and Sun 12pm-5.30pm. Admission: Adults £4, Concessions £3, Free to Under 18s and students. 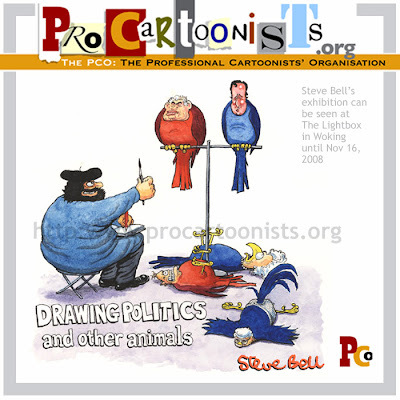 Steve Bell’s Drawing Politics and Other Animals is a free exhibition at the Lightbox, in Woking. 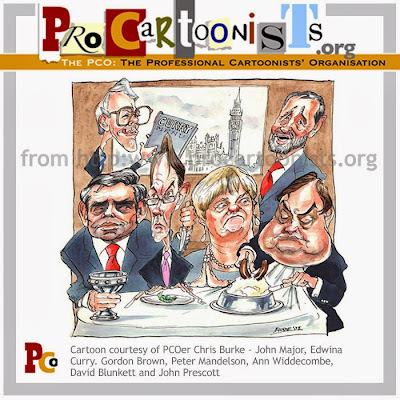 Re-live the political scandals of the 1980s and 1990s through the drawings and original artwork of Britain’s most renowned political cartoonist. Cartoons and Coronets: The Genius of Osbert Lancaster is at the Wallace Collection in West London. This free exhibition, which marks the centenary of Lancaster’s birth, celebrates his astonishing range as an artist and as a chronicler of style and fashion. Whoever wins the US election, he is probably unlikely to be as much of a gift to cartoonists as the guy who is currently putting his feet up in the Oval Office. The clocks have fallen back, and subsequently the nights are drawing in, so as we race towards Christmas publishers are putting out books on cartooning. Here’s a selection of recent example that may be filling stockings come December. First up is The History of the Beano: The Story so Far, a comprehensive round-up of the iconic DC Thompson comic from the last 70 years, here reviewed by the Daily Record and by Danny Baker in The Times. This book also ties in with the recent exhibitions in Dundee and the Cartoon Museum in London. The History Of The Beano – The Story So Far is published by D.C. Thomson and Waverley Books, priced £25. The Beano and Dandy Birthday Bash continues at the The Cartoon Museum, 35 Little Russell Street, London WC1A 2HH until 2nd November 2008. Next is Cartoons and Coronets: The Genius of Osbert Lancaster on the life and times of the late Daily Express pocket cartoonist Osbert Lancaster, which is reviewed in the New Statesman, the Spectator and by cartoonist Nicholas Garland in the Telegraph. This book also ties into an exhibition at the Wallace Collection (reviewed in the Telegraph, the Guardian, and the Independent) . Cartoons and Coronets: The Genius of Osbert Lancaster, edited by James Knox, is published by Frances Lincoln Publishers Ltd, priced £25. The exhibition continues at The Wallace Collection, Hertford House, Manchester Square, London W1U 3BN until 11th January 2009. 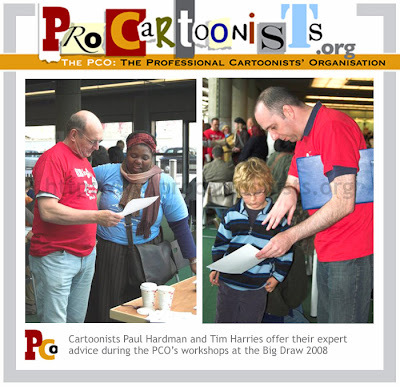 And finally we come to The Best of Punch Cartoon, a collection of cartoons from the legendary satirical magazine spanning over 150 years of humour, the launch of which was attended by the PCO’s own Pete Dredge. Reviewed here by cartoonist Peter Brookes of the Times, by Michael Heath, cartoon editor of the Spectator, and in the Independent. 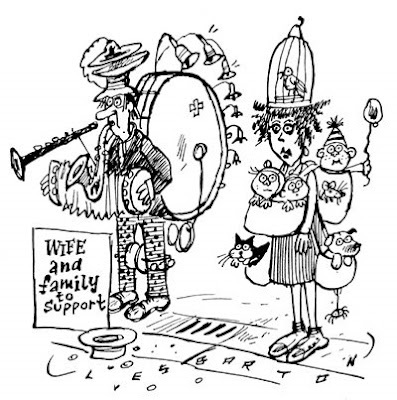 The Best of Punch Cartoons, by Helen Walasek, is published by Prion Books, priced £30. 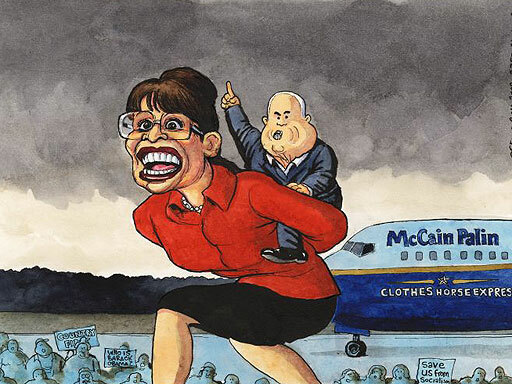 One: Steve Bell in the Guardian on Sarah Palin’s wardrobe allowance. Two: Nick Newman in the Times on the Madonna/Guy Ritchie divorce. Three: Dave Brown from the Independent on George Osborne and Peter Mandelson’s boat trip. There are cartoon fossickers who dig and delve among old comics – I’m talking American comics, circa late 1930s and early 1940s, looking for, and still finding, strange treasures and curios. Like, for example, Stardust, Fantomah, Buzz Crandall of the Space Patrol and, finally, Big Red McLane of the Northwoods. The link between them is the late Fletcher Hanks, cartoonist, strip artist and, according to R. Crumb, “a twisted dude”. He should know. 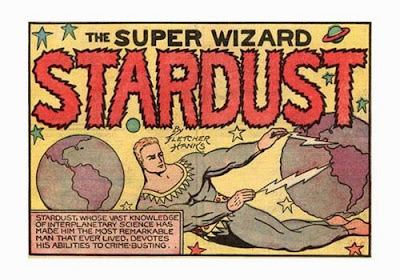 The comic Stardust features in the Collected works of Fletcher Hanks reviewed here by PCOer John Jensen. Gary Panter, an American illustrator and a former denizen of the psychedelic era but now a hugely successful graphics person wrote the following for the jacket blurb of the collection I am about to review for you. In one story, our super-sized, booming voiced hero uses a boomerang ray; a fusing ray, his reducing ray and, finally, his transporting ray. In other strips he makes himself invisible, travels faster than the speed of light and has an active anti-gravity ray, a magnetic ray, a suspending ray and a disintegrating ray – the ray doesn’t disintegrate but other things do! His mental power stops thugs from shooting at him while, also under his belt – you should see his belt! – there is an attractor beam and an agitator ray. The villains, always grotesque and quite mad, are invariably captured after which they meet their hideous eternal variegated dooms. No doubt Stardust celebrates victory with his very own Hip Hip Hoo Ray. Fantomah, the Mystery Woman of the Jungle, had many edgy, disconcerting powers of her own, including the ability when cross, of turning her face into a skull. Very useful in a supermarket queue I would guess. Another curious point about the anthology is that the Afterword is a strip written and drawn by Paul Karasik, who met and was slightly shocked by the artist’s son who apparently hated his Dad. Hanks was allegedly a drunkard, a liar and, to cap it all a deadbeat who froze to death on a park bench. He also painted ducks in a pond. The Comics of Fletcher Hanks “I SHALL DESTROY ALL CIVILIZED PLANETS!” was recently published by Fantagraphic Books. If you’re a Knockout or Beano fan you might not care for, or about, this extraordinary gathering of super surreals but if, like me, you grew up with American comics you’ll be full of beans. Jellybeans. Les Barton, a fine cartoonist who worked in both the gag cartoons and the comics markets, has died. He was as well known for cartoons in magazines such as Punch as for his comic work, including the much-loved “I Spy” in Sparky. 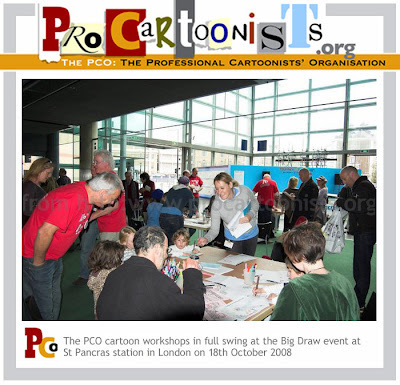 Born in 1923, he began selling cartoons in the 1940s and was a long-standing member of the Cartoonists’ Club of Great Britain, attending its inaugural meeting in 1960. Cartoonist and blogger Lew Stringer has more on the comics work of Les Barton. UPDATED: 26th November 2008. Full obituary written by Dr Mark Bryant from The Independent newspaper. The title of the workshop I ran was “Who Do You Think You Are?” It involved a very long roll of paper on which I had drawn about twenty train carriages. Participants were invited to draw a self portrait in each window and then put their names and where they were from underneath. After a slow start (10am) the activity grew and proved to be a great success, continuing throughout the day until we had run out of carriages and children were left asking for more! An interesting metamorphosis developed as several windows became visual puns on the word “coach”. We had the football coach and the stage coach for example. The results were pasted to the side wall of the “Battle Arena” and made a very effective display. 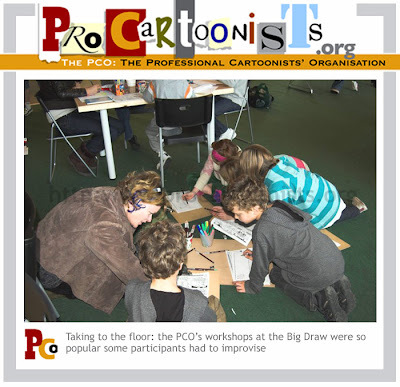 Judging by the of amount paper and sponsored pencils we went through, this year’s workshops were thoroughly enjoyed by cartoonists and public alike. 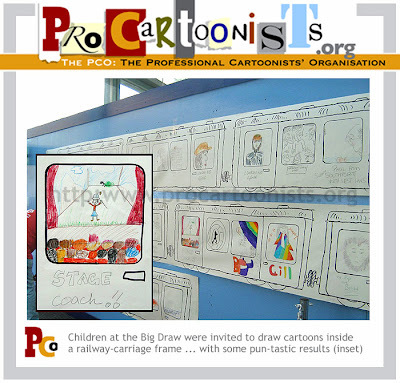 Any available large space (blank walls, concourse pillars, some of the heavier cartoonists) was turned into a gallery to proudly display the transport-themed cartoons, comic strips and characters produced. Next door’s Starbucks aided flagging artists and parents as the kids kept us busy from 10am til 5pm, with quite a few families staying the entire day and taking part in each of the five workshops. 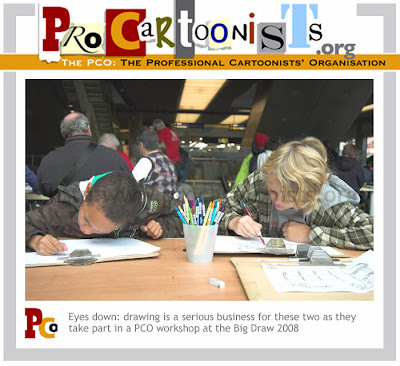 Other participating PCO cartoonists were Terry Christien, Chichi Parish, Robert Duncan and John Landers. Photos by Gerard Whyman and Royston Robertson. 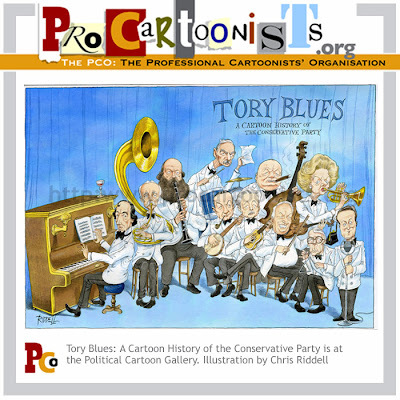 An exhibition called Tory Blues: A Cartoon History of the Conservative Party opens today (October 21) at the Political Cartoon Gallery in London and runs until January 7, 2009. 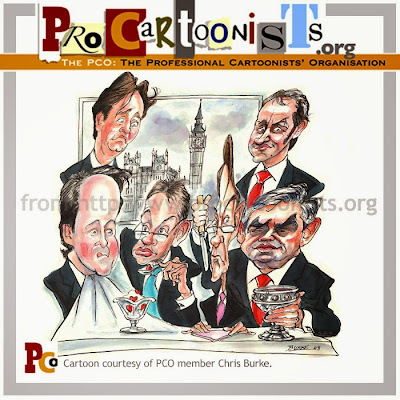 It features original political cartoons charting the history of the Conservative Party from Benjamin Disraeli, through the likes of Balfour, Baldwin, Churchill, Thatcher and Major, to today’s Party Leader, David Cameron. Included, for the very first time on display, are original cartoons covering both the Party’s election victories and defeats as well as important events in the history of Britain’s most successful political party. 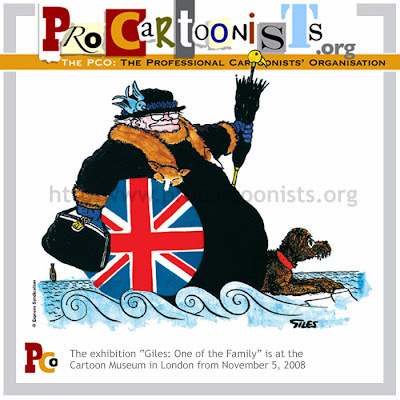 The exhibition consists of 60 original cartoons by leading cartoonists both past and present including work by Sir John Tenniel, Sir Francis Carruthers Gould, Sidney Strube, Sir David Low, Leslie Illingworth, Trog, JAK, Michael Cummings, Nick Garland, Ronald Searle, Steve Bell, Chris Riddell, Paul Thomas Dave Brown, Peter Schrank, Martin Rowson and Peter Brookes among many others. The exhibition is to be opened by the former Conservative MP Mathew Parris. A book by Alan Mumford entitled Tory Blues will accompany the show. 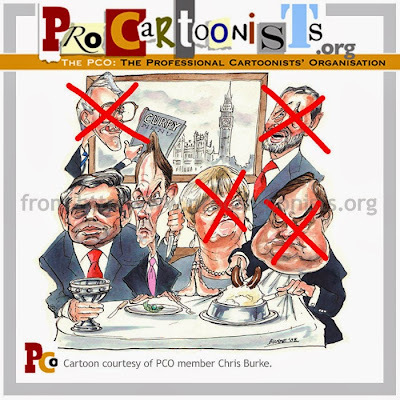 The Political Cartoon Gallery, at 32 Store Street, London, is open Monday to Friday 9.30am – 5.30pm and on Saturdays between 11.30am – 5.30pm.